In context of Board’s letter cited above, references hove been received in Board’s office from some Zonal Railways. Seeking clarifications regarding entitlement of Breakdown allowance to Technician Gr.III drawing pay in higher level i.e. Pay level 3 under MACPS rather than the pay level available for the post. The issue has also been raised by AIRF in PNM Forum as item No.15/2018 and NFIR in their letter dated 11.04.2018. 2. 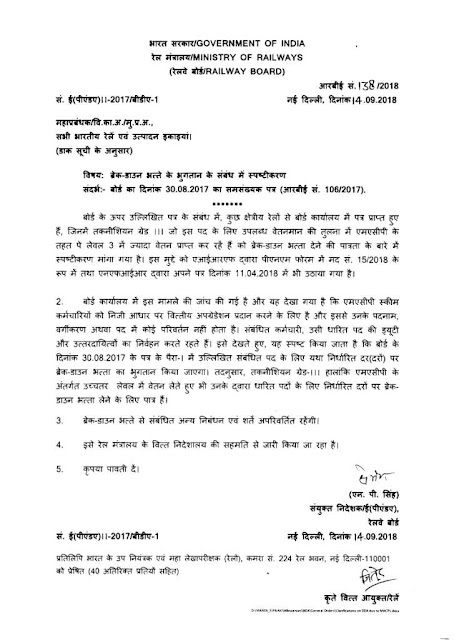 The matter has been examined in Board’s office and it has been observed that the MACP Scheme provides for grant of financial upgradation to the employees on personal basis and there occurs no change in the designation, classification or status. The concerned employees continue to discharge the duties and responsibilities of the post held by them. In view of this it is clarified that the Breakdown Allowance has lo be paid at the rate(s) as prescribed against the respective post mentioned in para- I of Board’s letter dt. 30.08.2017. 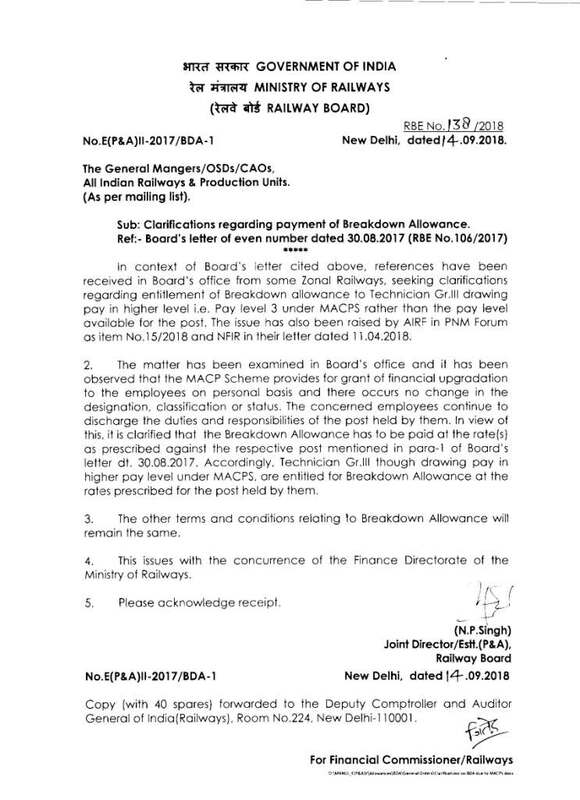 Accordingly, Technician Gr.III though drawing pay in higher pay level under MACPS are entitled for Breakdown Allowance at the rates prescribed for the post held by them.